Multipurpose Tool Kit with Powerful Drill Machine Imagine if you can carry your tools with you wherever you go? Sounds great! Yes it does, as the latest multipurpose drill kit has every tool you require for any assistance. All put together in a carry case. 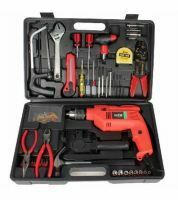 The drill kit contains a drill machine and other drilling accessories. The drill machine has double insulated shock proof plastic body, reversible lever to reverse the direction of drilling easily, electronic speed adjustment for varying speeds for hassle free drilling. Depth gauge - to drill the holes to its accurate depth. Great tool kit for all your drilling needs.